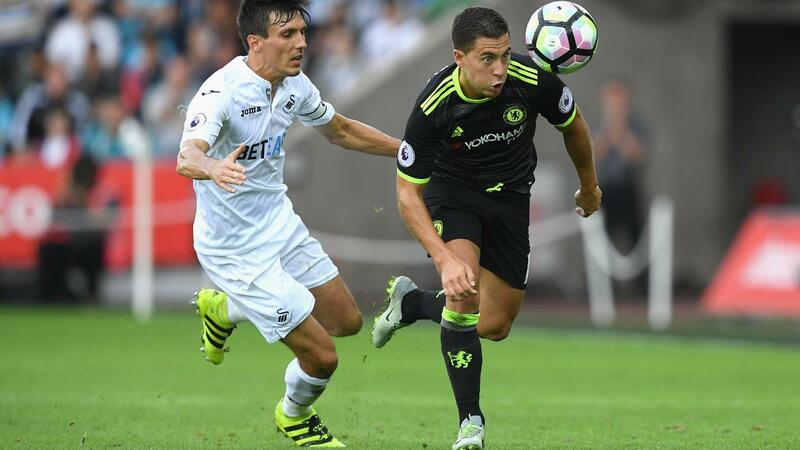 Visitors Chelsea collected the majority of the bonus points in Sunday's draw at the Liberty Stadium. Diego Costa (£9.8million) received the maximum bonus, scoring 45 in the Bonus Points System (BPS). The striker netted both of Chelsea's goals in addition to completing two dribbles; he has now scored more goals (seven) against Swansea City than against any other Premier League side. Branislav Ivanovic (£6.0m) was awarded two bonus points, with 26 in the BPS. The Chelsea right-back supplied the assist for Costa's second strike, supplementing this with 30 successful passes, four clearances, blocks and interceptions (CBI) and two completed dribbles. Gylfi Sigurdsson's (£7.3m) score of 24 in the BPS earned him a single bonus point courtesy of his first goal of the campaign via the penalty spot. Chelsea dominated the top four spots in the ICT Index with Costa sitting at the summit. The two-goal frontman registered 12 touches inside the Swansea penalty box, firing four close-range attempts and three shots on target. With only Sunderland’s clash against Everton remaining in Gameweek 4, Costa is ranked first overall in the ICT Index with a score of 19.4. Despite failing to pick up FPL returns, Willian (£7.4m) sits in second spot after producing four attempts on goal and six key passes. The Brazilian - who also completed six of his eight crosses - is currently top for Creativity in Gameweek 4 with a score of 87. Eden Hazard (£10.2m) was placed third with an Index tally of 12.0. The Chelsea winger fired two shots from inside the box and created four goalscoring chances for the visitors, in addition to making 24 successful passes in the final third - more than twice the number of any Chelsea player. Oscar (£7.5m) recorded 10.8 in the Index having produced six attempts on goal for the Blues but managed just one on target. The midfielder also supplied a key pass on three occasions and provided the assist for Costa’s opener. Although Hazard suffered his first blank of the season, Costa's renaissance under Antonio Conte shows no sign of slowing - he is the only player in the Premier League to score or assist in all four fixtures so far. The striker was backed by 396,364 new FPL owners heading into Sunday and captained by 6%, as confidence in the Spaniard grows. Conte named an unchanged XI from the one that beat Burnley in Gameweek 3 but the nature of his side's defending will give the Italian concern. John Terry (£5.5m) is doubtful for Friday's encounter against Liverpool due to an ankle problem, with new boys David Luiz (£6.0m) and Marcos Alonso (£6.0m), who were both unused subs on Sunday, pushing for inclusion. Francesco Guidolin started with a 3-5-1-1 formation but changed tactics in the first half. Neil Taylor (£4.4m) was handed his first start of the season but was substituted before the break, with Stephen Kingsley (£4.1m) now looking ahead of the Wales international in the pecking order at left-back. Leroy Fer (£5.2m) continues to offer excellent value in the centre of the park. The Dutchman's second-half strike was his third in the first four rounds of fixtures; he's currently owned by 9.6% of FPL managers.